The morning's crowd turnout was one of the biggest during July's month-long celebration of the anniversary of Suchitoto's naming. 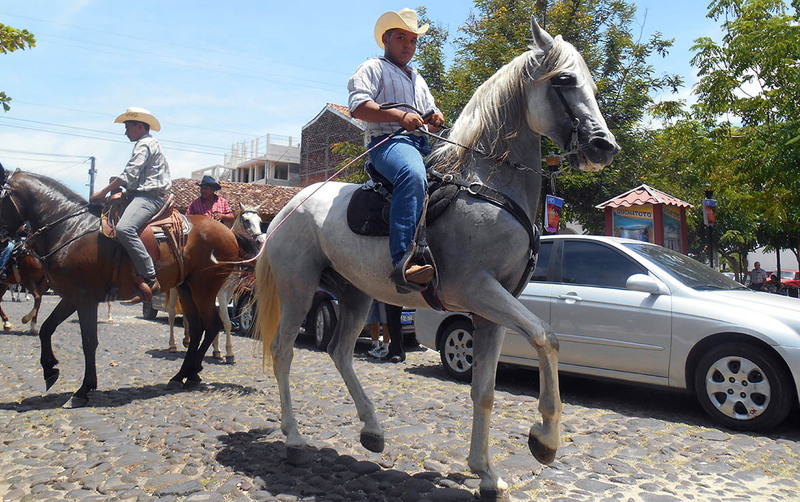 Cowboys were riding into the picturesque town, and locals and tourists alike lined the main road that leads into the village to see the spectacle. There they waited. And waited. 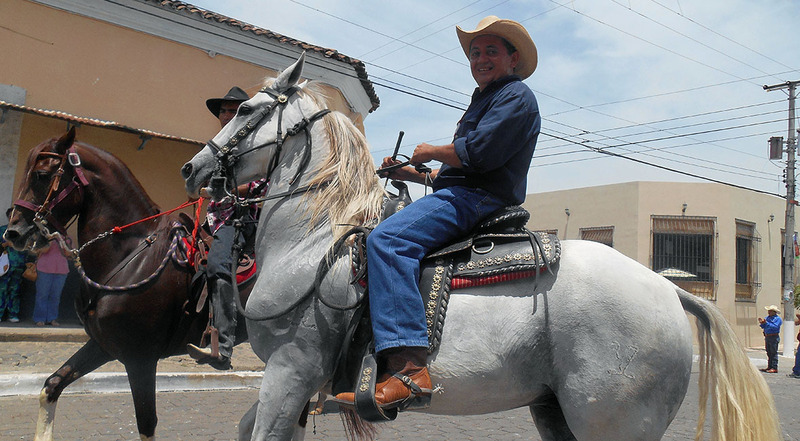 The program proclaimed that a parade of horses would begin at 10 am. But Salvadorean time, especially in small towns, is apt to run about an hour behind. A gathering was happening about six blocks away, in a small field with a few shade trees next to Suchitoto's only gas station, the unofficial boundary of the city's center. The two dozen or so riders were organizing in their own way. Some put their mounts through paces, running practice trots, anxious to get the show going. Others lazed in the shade as preliminary announcements were made, a moment of silence for a group member who had passed. The onlookers at the rallying point were a handful of police, expressions clear that they would not need the automatic weapons slung over their shoulders, their roles as protectors of public safety changed to that of curious bystanders. Finally, they were off. Riding crops thwacked as the pack descended the slope into town, paved road giving way to cobblestone that echoed under the clacking of hooves. Riders of all temperaments partook in the procession: Serious young bucks out to show off their skills, steering their steeds in precise, regimented steps; Older riders with steadfast hands on reins; Riders in their early teens trying to stay steady in the flow; A few young women keeping track with the pack of horses of all breeds – from a commanding white stag with brightly colored rope reigns, to little brown nags keeping feisty pace. Most horses were mounted with traditional western saddles over blankets embroidered with indigenous designs. Western wear was the style of the day. Cowhand-toughs favored the uniform of checked shirts, jeans and boots. Others sported fancy cowboy shirts with sheen, along with flapping fringe on leather vests bedecked with silver studding. Cowboy hats in every style were represented, from fancy felt Stetsons adorned with glittering bands, to straw head coverings that have seen lots of field service, with a few baseball hats in the mix. Some riders completely eschewed the cowboy motif for golf shirts and sport sunglasses, chatting on cell phones as they trotted into town. Residents turned out in the their best cowboy finery in solidarity, with locals usually seen in sensible shoes clicking across cobblestone in their best heeled boots. As the riders rounded into the receiving area, they didn't stop as one might think, but continued on to a narrow side street. An announcement explained that the posse was paying visits to local watering holes. Necio was the first stop. The left-leaning bar, which stands as a monument to the guerillas in El Salvador's long civil war, offered bottles of cold Pilsener beer and Cuba Libres to stave off the ever-increasing heat of the late morning sun. Some riders quickly downed their drinks and moved on to the next stop. Others lingered in the street, chatting with fellow riders and some spectators who wandered the maze of horses. The smattering of order at the gas-station assembly was soon gone as the pack of riders broke into smaller crews to lope around the town. The next stop was the restaurant Harlequin. The cozy garden eatery was also hosting a group of bicycle riders, their form-fitting Lycra outfits and high-tech racing gear standing in sharp contrast to the throwback cowboys. Parade-goers loosely followed the route, slipping down side streets to watch small clusters of riders in loose formation, drinks in hand as they navigated around town. Eventually, the cowboy crew reassembled at an intersection that was blocked off for the festivities, where shade was found under a large tent serving cold drinks, with the aroma of grilled meat floating across the dais. A dusty old carpet was unfurled in the street, setting free a few field mice who had called the roll home. Individual riders hit the carpet for presentations that might be called dressage in fancier equestrian circles. 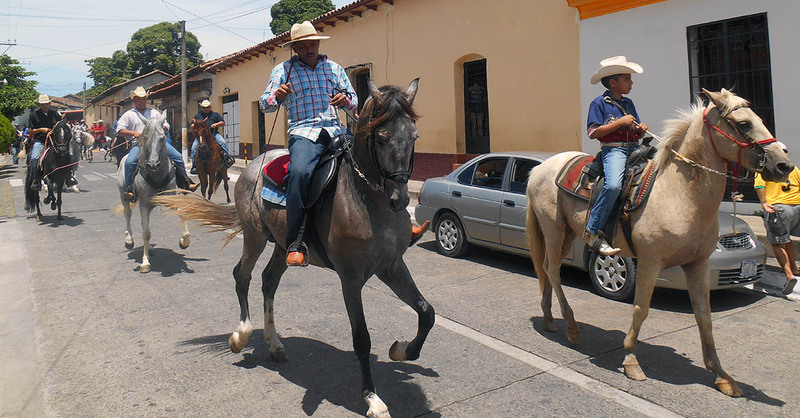 Horses did quick-step dance routines and tricks like lying down on command before the riders finally rolled out of town, leaving behind a minefield of manure piles as the only evidence that cowboys had taken over Suchitoto for a short spell.